If you are looking for a good compromise between mobility and performance, a 14-inch notebook can be an attractive alternative to the usual 13 and 15-inch devices. 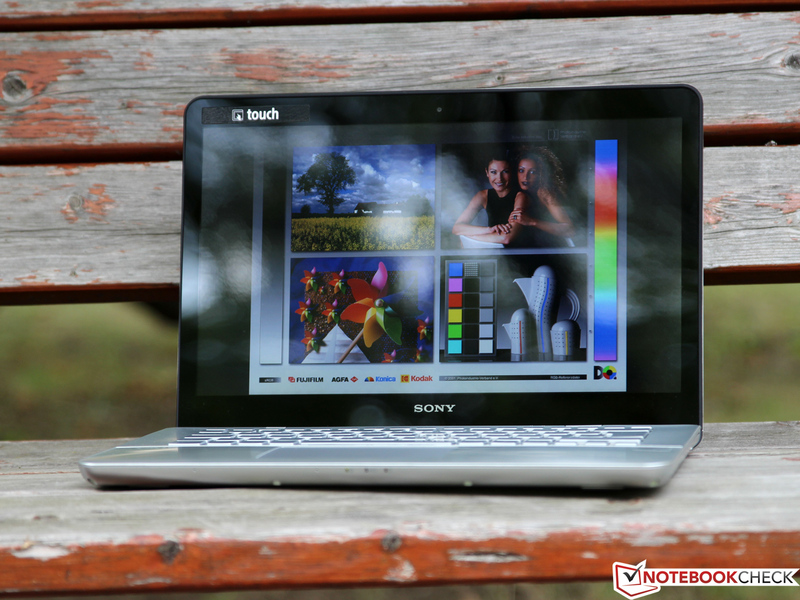 Sony offers such a device with the Vaio SV-F14A1M2E/S that was designed as a versatile multimedia notebook for different scenarios. 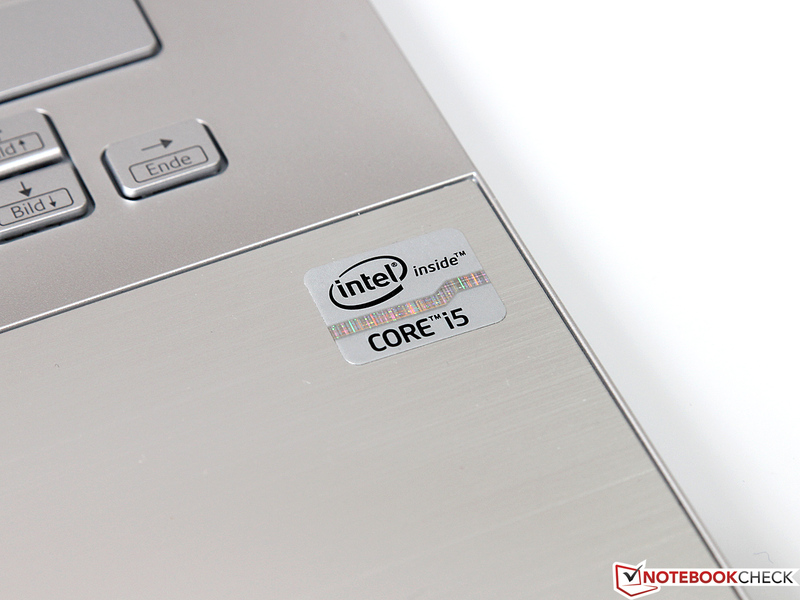 For a retail price of around 880 Euros (~$1188), at the time of this review, you get an Ivy Bridge Core i5-3337U processor, which is supported by 8 GB RAM and a 750 GB hybrid hard drive. Gaming enthusiasts will be happy about the dedicated Nvidia GeForce GT 735M, which has to handle the display resolution of 1,600x900 pixels (WXGA++). 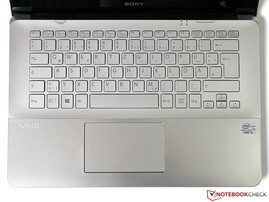 Sony uses a glossy touchscreen, a common choice for a notebook with Windows 8. 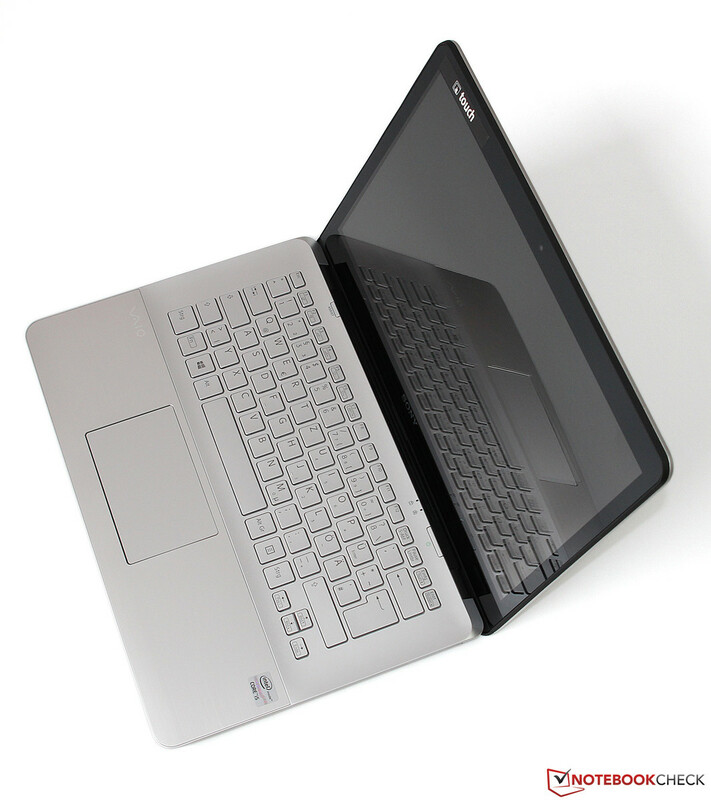 Although the product variety on the 14-inch segment is smaller compared to 15-inch devices, there are numerous competitors for the Vaio SV-F14A1M2E/S. 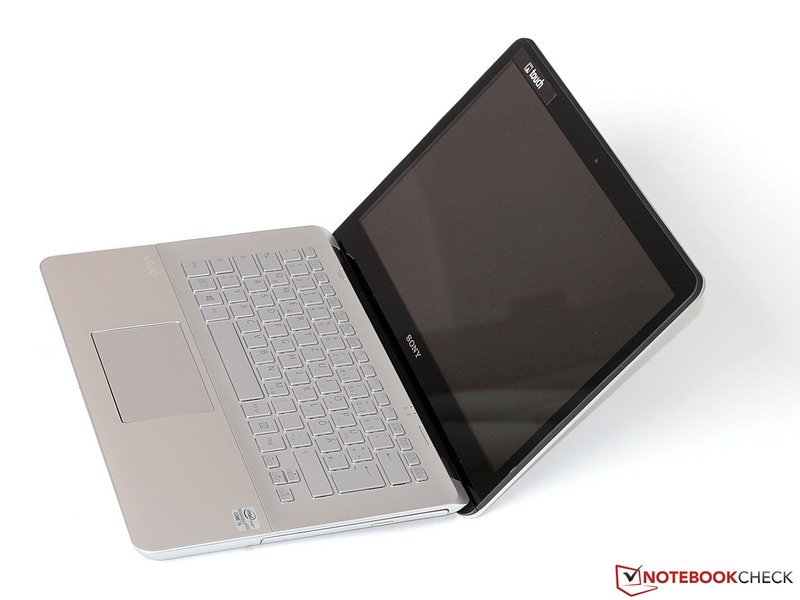 For example, Samsung's 530U4E or Lenovo's IdeaPad U430, but also more expensive rivals like the Schenker S413. Mixture of plastic and aluminum. 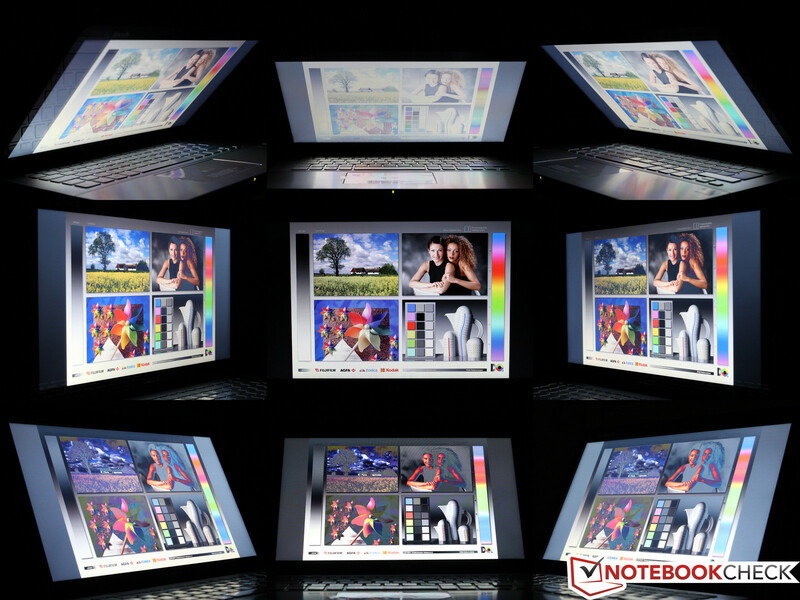 The period of bulky multimedia notebooks with limited mobility is fortunately over. 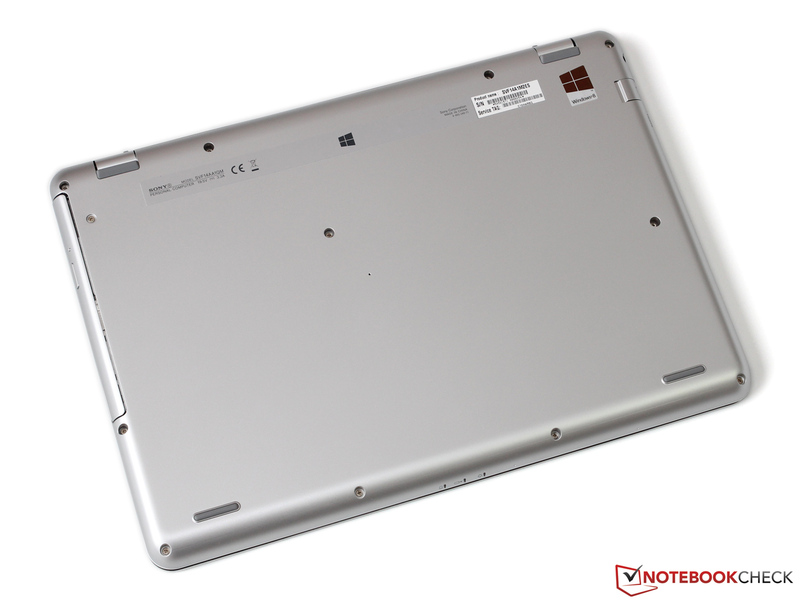 The designation Fit suits the device well – the design of the 14-inch notebook is not only dignified and modern but also very compact. A thickness of around 22 millimeters (~0.87 inches) can almost compete with an ultrabook but the SV-F14A1M2E/S is comparatively heavy at 2.2 kilograms (~4.85 pounds). Our review unit leaves a solid impression in our first quality check. 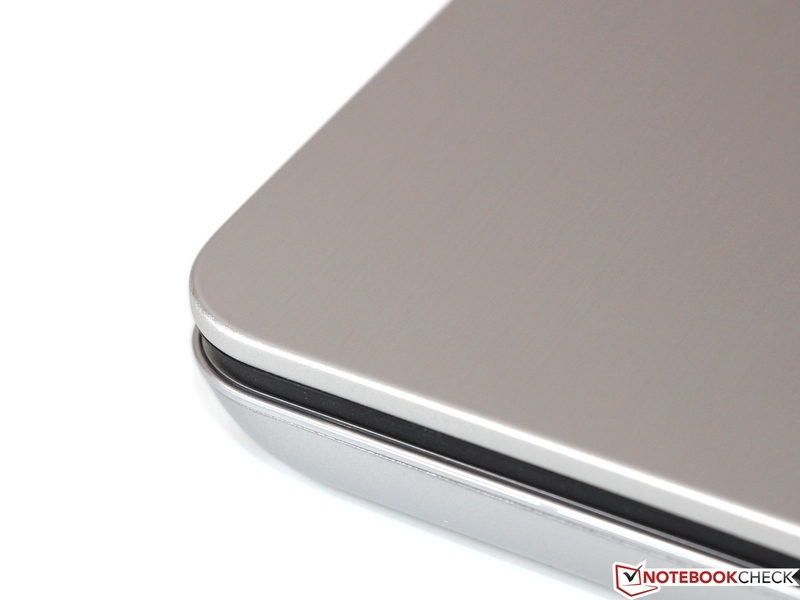 Display cover and palm rest are covered by brushed aluminum while many other parts are only made of silver-painted plastic. 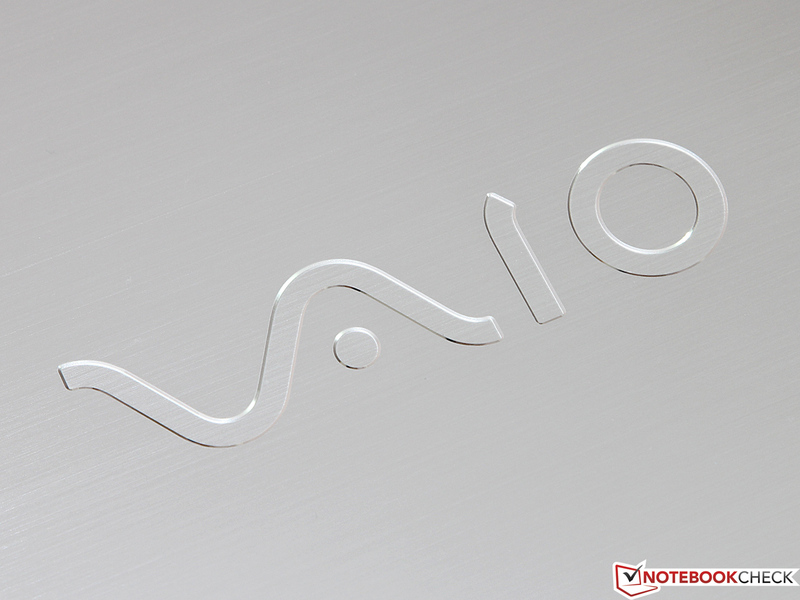 They leave quite a high quality impression but the stability of the Vaio is just average. 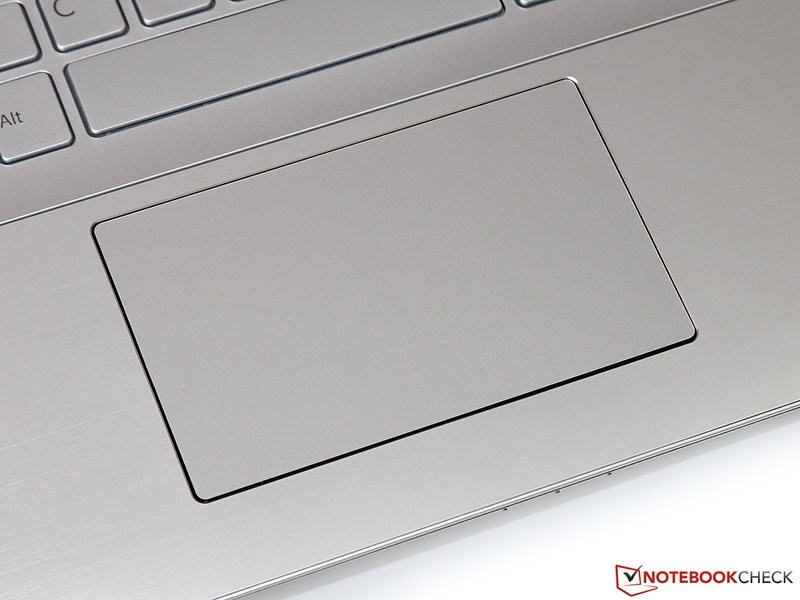 Especially the area above the keyboard can be easily dented; however, this is common for thin notebooks. The display on the other hand is very torsion-resistant; the two hinges are very firm but unfortunately not very precise. Similar to the materials, the build quality also meets our expectations for this price range. We could not determine any significant problems with our review unit; small problems like some inconsistent gaps will not affect your daily tasks. The overall verdict is good, but not quite on the same level with the competition from Samsung and Lenovo. 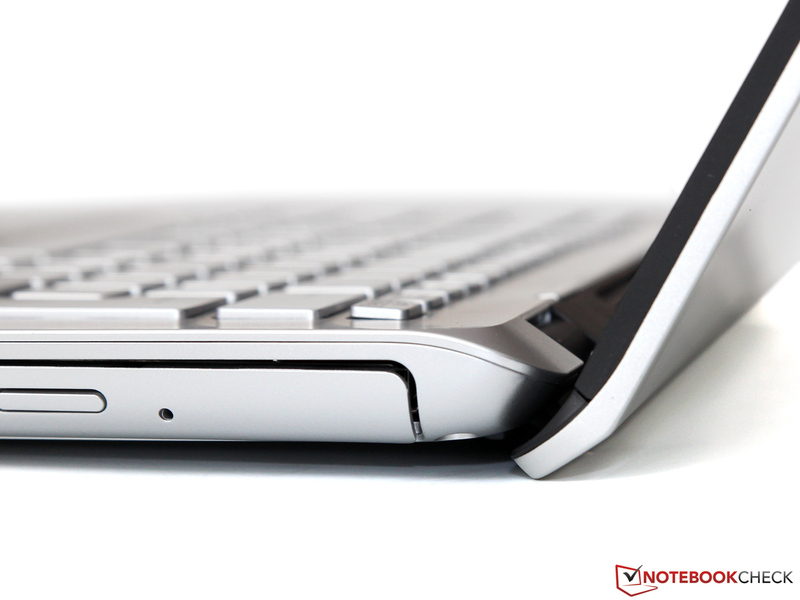 Not only the thin case but also the meager port equipment is a similarity to many ultrabooks. 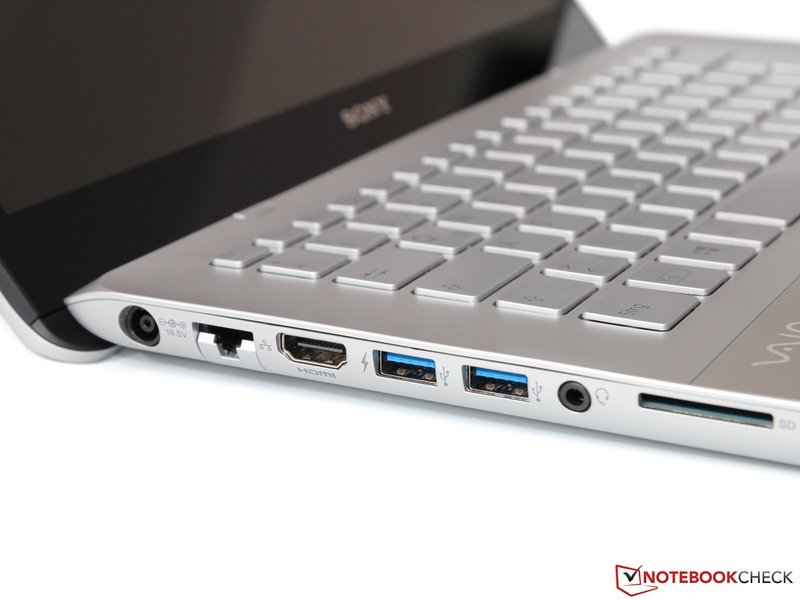 Two USB 3.0 ports are quickly occupied in practice and you might need an additional USB hub. The limitation to one HDMI port is not the best decision either. However, we also want to give Sony credit for the implementation of a card reader, Gbit-LAN and a DVD burner. The latter is on the right side of the case while all the other ports are on the opposite side. Especially right-handers benefit from this layout – you will have problems with cables if you want to use a mouse on the left side of the case. 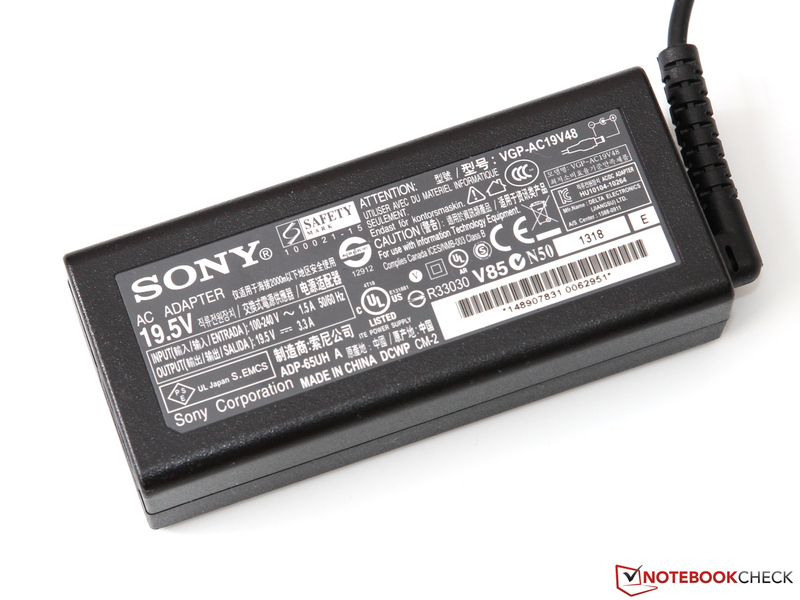 Sony’s Vaio SV-F14A1M2E/S is not really a low cost device, so it is unfortunate that the manufacturer decided to integrate a cheap wireless adaptor from Broadcom. The BCM43142 only supports single stream and single band (only 2.4 GHz) networks with the 802.11 b/g/n standard. That is not the only problem: We can completely confirm several user reports about weak wireless performance after our tests: We only determined a maximum transfer rate of 72 Mbit/s, even with a very short distance to the router. Longer distances (a couple of meters/~seven feet) indoors and some walls in between are usually enough to lose the connection completely. As a consolation, the notebook is equipped with Bluetooth 4.0 and even NFC. We had no problems to connect a Galaxy S4 and share a hyperlink between both devices. The integrated 0.9 MP webcam can be used for snapshots and video chats. You should not expect too much in regard to the quality. Even good lighting conditions result in limited details and significant picture noise. The muffled microphone is also average. You can only find the necessary accessories in the box – some small brochures and a 65-Watt power supply unit. 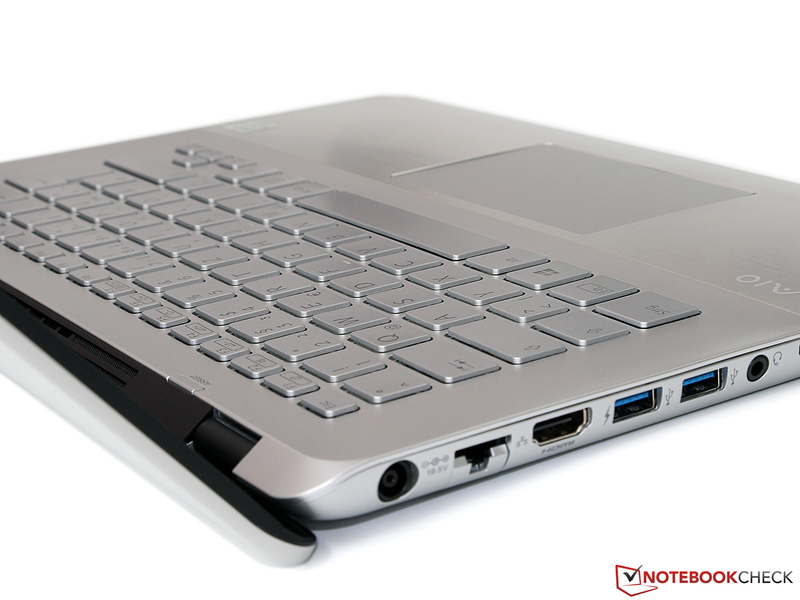 Other additional accessories in the form of software are already preinstalled on the notebook. Besides some highly unnecessary advertising applications and links, Sony also integrates a trial version of McAfee Internet Security and the VAIO Care center, which can also be activated with the Assist button above the keyboard. This well designed application combines important security and system settings, including diagnostic tools, system recovery and support information. After you loosen all the screws at the bottom, you can remove the DVD burner, which covers three more screws you have to loosen. Then you can remove the whole bottom cover and gain access to all the hardware. 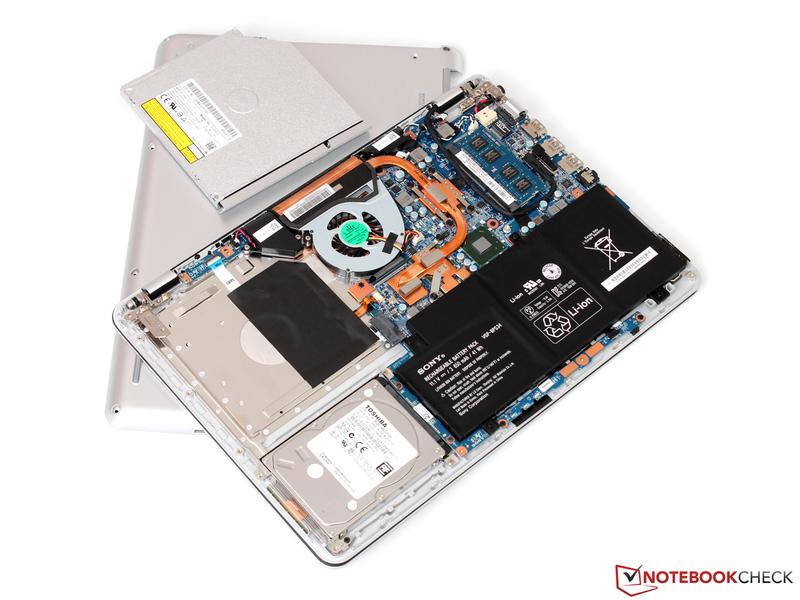 The maintainability includes a replacement of the hard drive, battery (fixed with screws) and the memory module (1 slot, occupied). It is also quite easy to clean the fan and the cooling system. 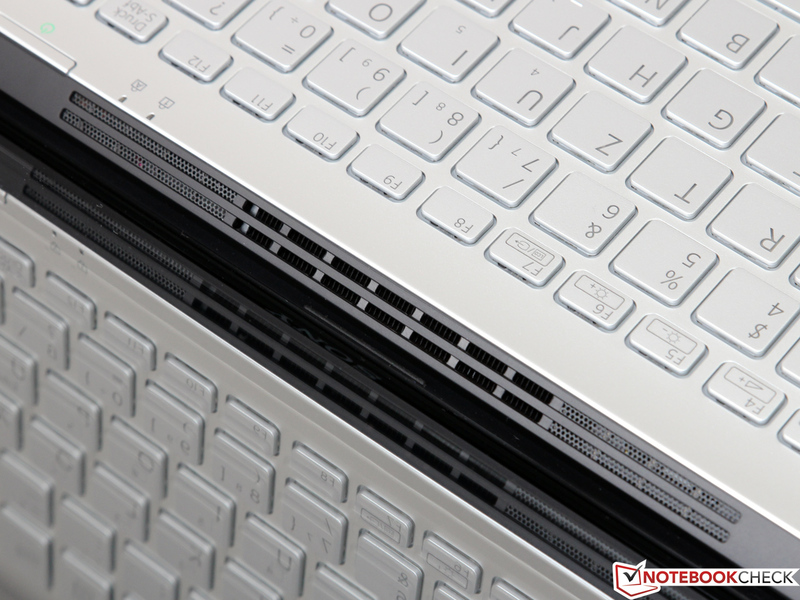 Sony only grants a 12-month warranty ex-works that can be extended to 24 months for no additional charge after the registration of the notebook. Additional service packs can be bought in Sony’s online shop; an extension for one year (VAIOBOXEWY1) is around 90 Euros and two years around 170 Euros (~$122 and $230 respectively). 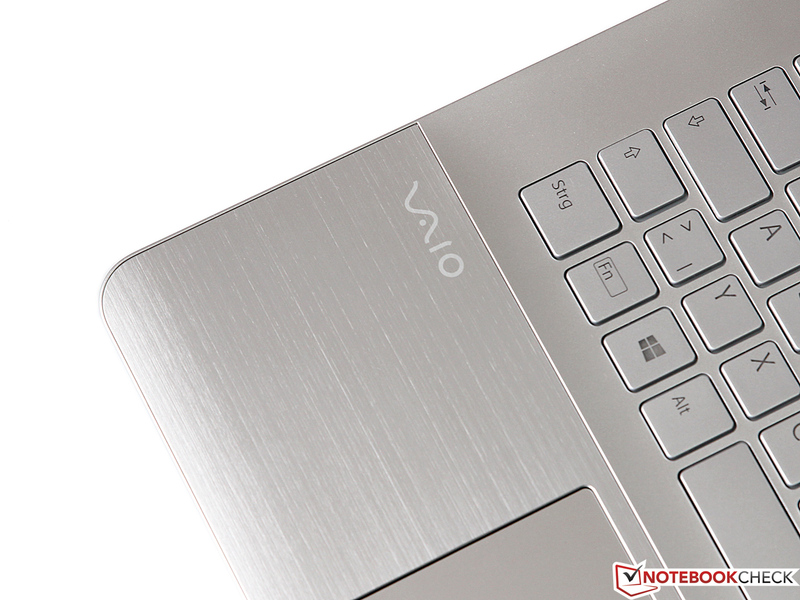 Contrary to the larger sibling Vaio SV-F15, our review unit does not have a separate numeric keypad. Apart from that, both devices are very similar: The large 15 x 15 mm keys are made of silver plastic and can convince with a good haptic and an elegant background illumination. 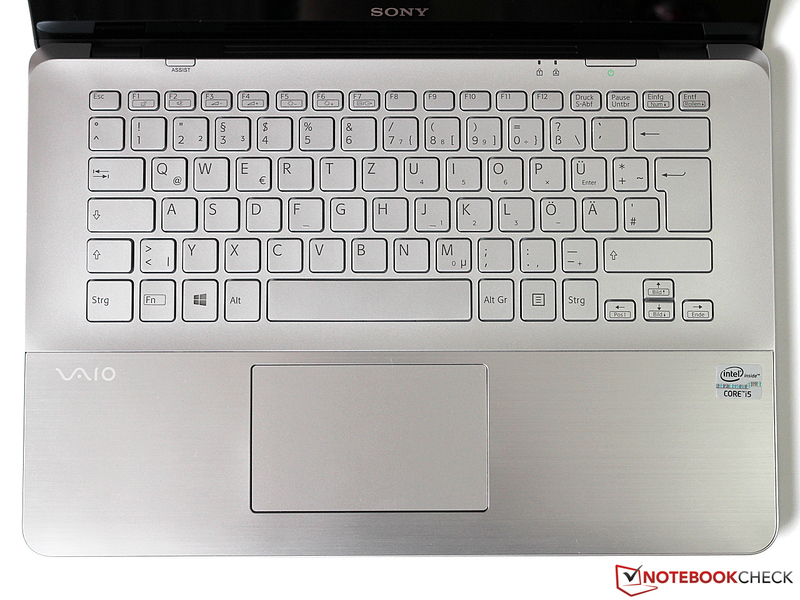 You can adjust it in three steps (On, Off, Activate by typing) but you can only select them via Vaio Control Center. You will have to get used to the short key travel and the wobbly pressure point when you use the keyboard for longer texts the first time. You do not get a precise feedback from every keystroke. However, there are also positive aspects like the low noise development and the excellent build quality. 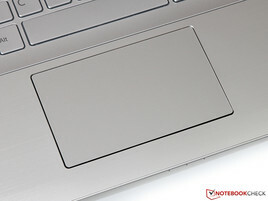 The large 10.5 x 6.5 cm (~4.1 x 2.6 inch) touchpad is provided by Synaptics and is a so-called ClickPad, which means the mouse buttons are directly integrated into the input device. Left and right clicks require some force and are accompanied by an audible and perceptible stroke. Thanks to the good gliding capabilities of the touchpad surface and the precise execution of inputs it is a very convenient mouse replacement. It supports multi-touch gestures with up to three fingers, which can be activated and deactivated in the driver. 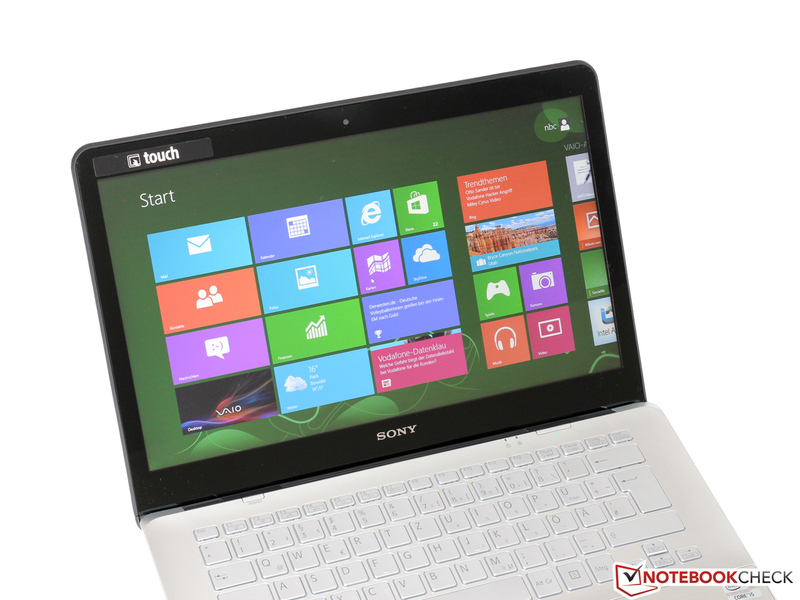 Sony follows the latest trend and equips the Vaio Fit with a capacitive touchscreen that should especially improve the handling with Windows 8 and its new tile concept. 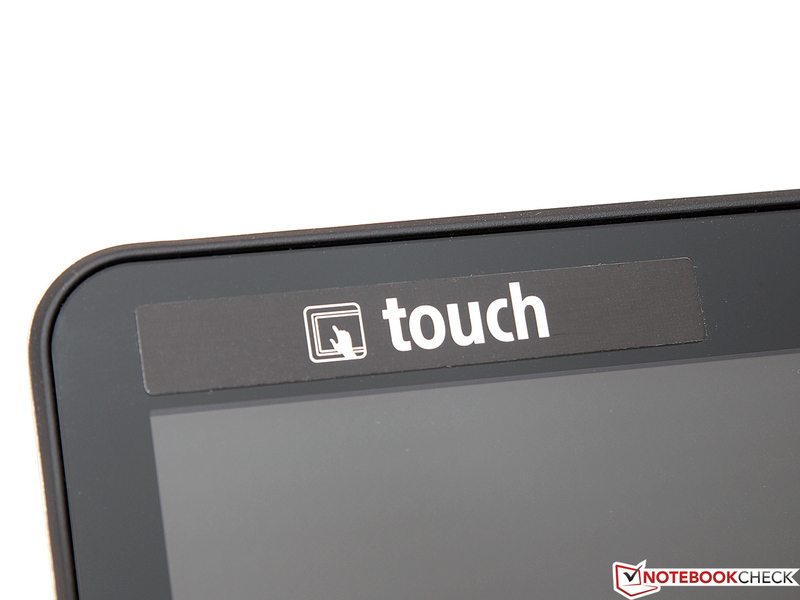 It works well and there is no lack of precision in the peripheral areas of the display. However, you should not expect too many benefits from the additional input device if you use the classic Windows user interface (Desktop) – the best solution is still a mouse in combination with a keyboard. 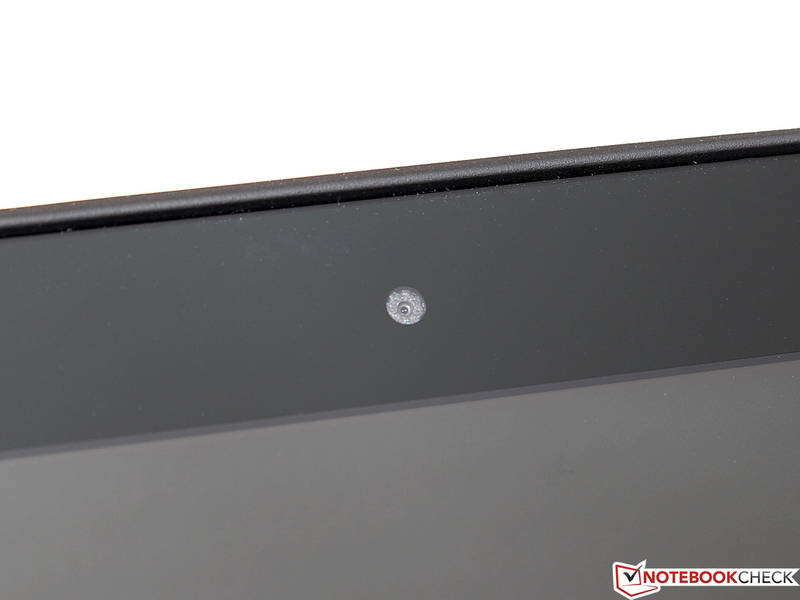 We want to mention one special characteristic related to the touchscreen: You can see a continuous dark pattern on the display surface from a very short distance – it seems that the touchscreen layer from the Vaio is not as transparent as many other devices. However, this is really only visible with a plain white background, many users will not even recognize it. Now we have a closer look at the display itself: The 14-inch screen has a resolution of 1,600x900 pixels and a pixel density of 131 ppi, which is above the average value of many competitors with WXGA resolution (112 ppi). The additional pixels not only improve the presentation of fine writings and symbols but there is also more space on the desktop for multitasking or complex applications. The display with an LED backlight reaches a maximum brightness of 224 cd/m² and the brightness distribution is very even. This is an average result for the Vaio Fit compared to similarly priced notebooks from other manufacturers that are usually between 180 and 280 cd/m². Sony uses a simple TN panel to reduce the costs; the B10RTN03 is provided by the manufacturer AUO. Black value (0.40 cd/m²) and contrast ratio (560:1) are overall satisfying and the glossy display surface provides rich colors, at least subjectively. Similar to many other consumer notebooks the display of our review unit is poorly calibrated and there is a visible blue cast. 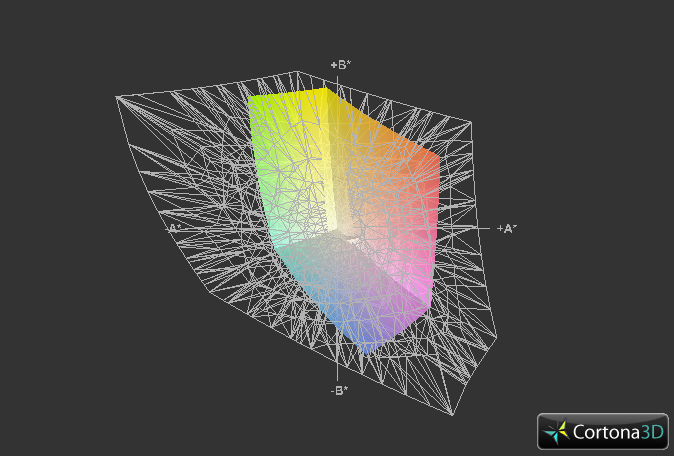 We determine a DeltaE value over 15 for cyan colors but the average deviation of 9.5 is also way too high. 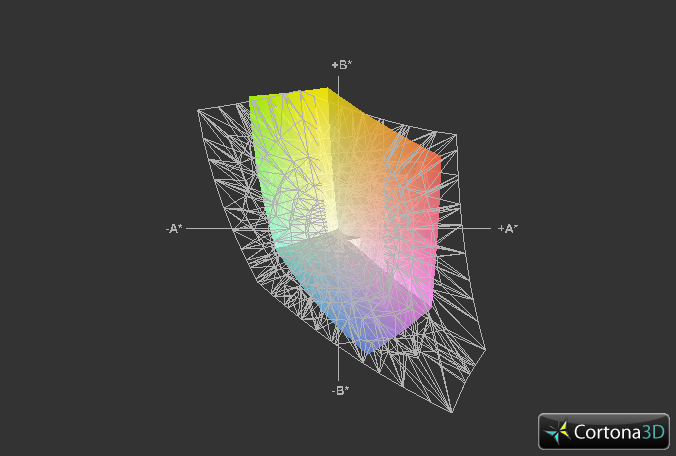 Another drawback is the limited color space – professional users that need sRGB and AdobeRGB color spaces will have to use an external display. 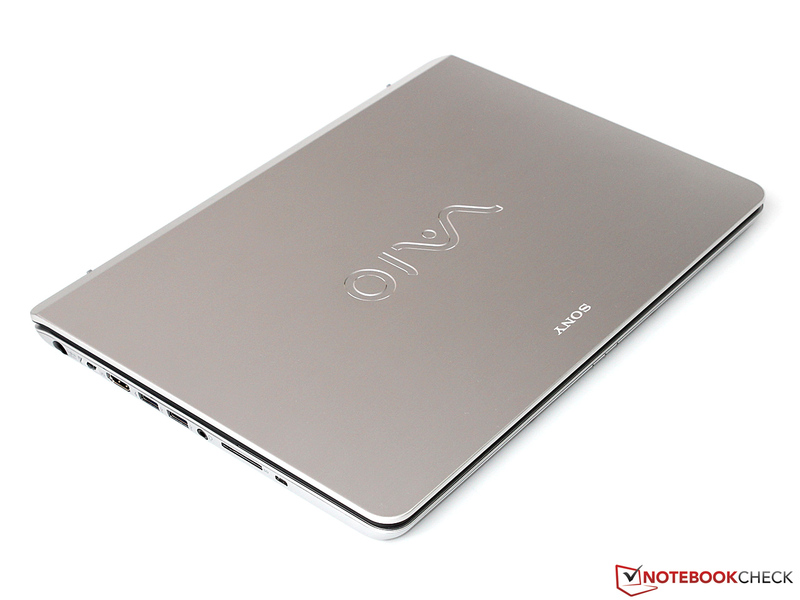 The Vaio is not perfect for outdoor use because of its glossy display. Direct sunlight results in annoying reflections and does reduce the visibility of the content so you will have to look for a place in the shade. 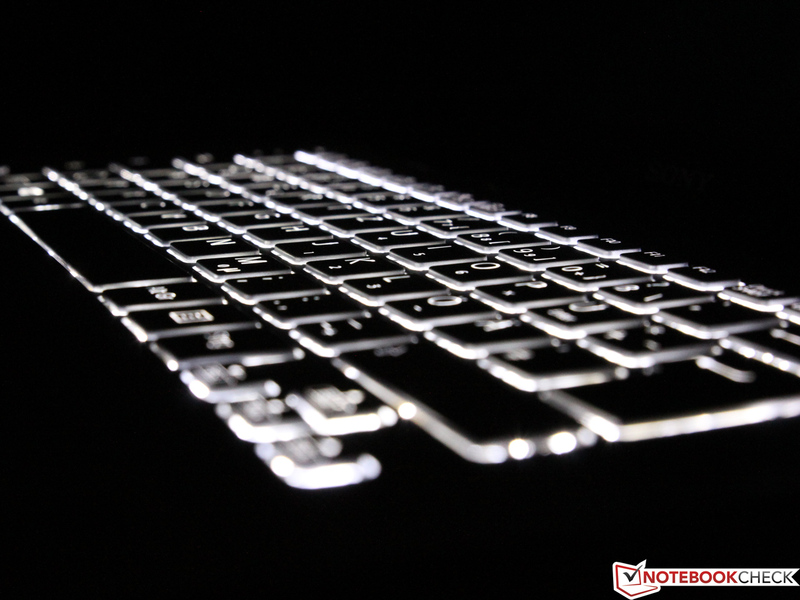 Even though higher display brightness would help in this situation – almost every notebook with a glossy display has similar problems. 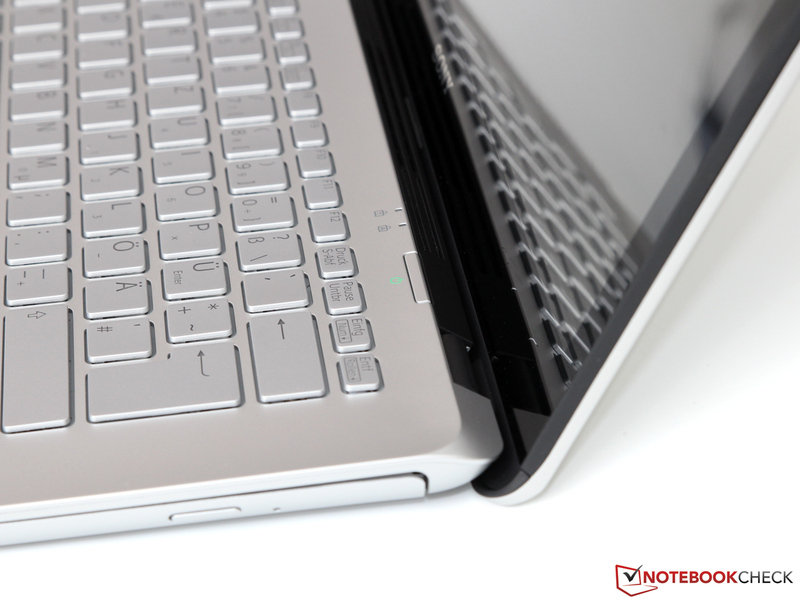 Extremely limited viewing angles are one of the biggest drawbacks of TN panels and the Vaio Fit is no exception. Especially vertical deviations from the center are very limited and the situation is not much better horizontally. 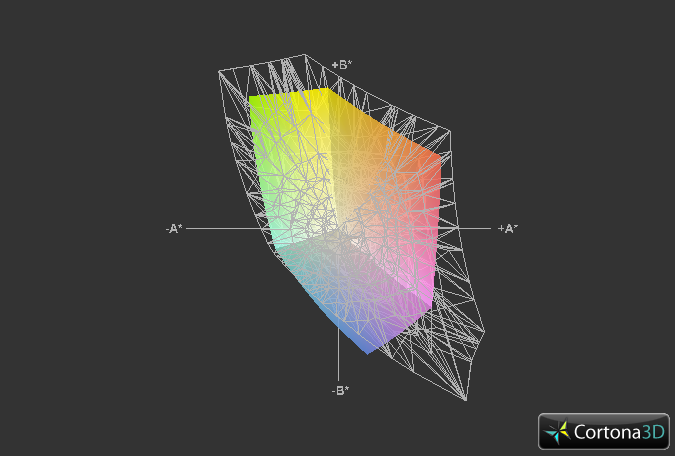 You can see color and contrast changes at an angle of around 30 degrees. IPS displays, for example in the Schenker S413, are superior in this regard. 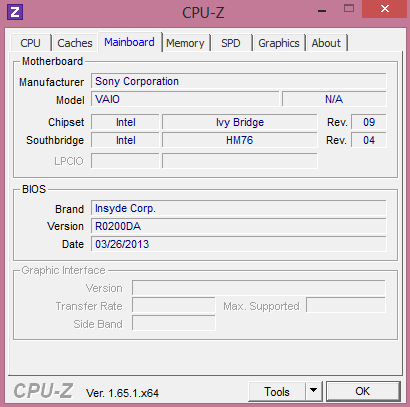 Even though the Ivy Bridge architecture has already been replaced by the latest Haswell generation, the Core i5-3337U is not outdated in terms of performance. 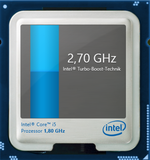 The performance per MHz is around 5 – 10 percent lower than the successor Core i5-4200U but the 3337U has a comparatively high clock of 1.8 up to 2.7 GHz (two cores up to 2.5 GHz). 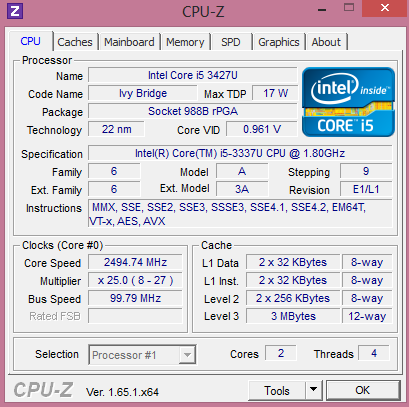 The Core i5 supports Hyperthreading as well as AES acceleration. All other features of the ULV CPU with a TDP of 17 Watts can be found in our CPU database. 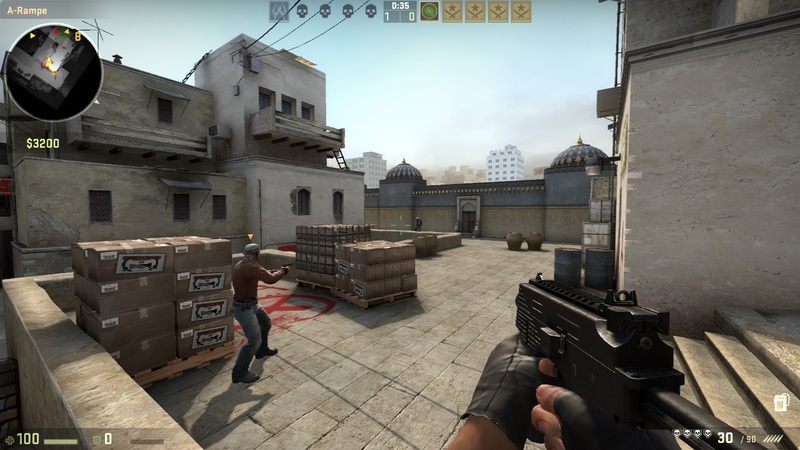 The integrated HD Graphics 4000 of the CPU is supported by an additional dedicated Nvidia GeForce GT 735M. The system chooses the suitable GPU depending on the situation via Optimus technology. While the Intel GPU is usually used during idle and light multimedia workloads, the GeForce GPU can be used for more complex 3D applications. 8 GB DDR3 RAM and a 750 GB hybrid hard drive are standard memory and storage equipment for this price class. We are especially interested in the hard drive with its additional flash memory and will investigate the performance advantages later in this review. It does not matter if you use the PSU or the battery; the Core i5-3337U has no problems to reach its maximum Turbo clock speeds and therefore the expected performance. The CPU can maintain 2.7 GHz in single threaded applications and gets a score of 1.11 points in the corresponding Cinebench R11.5 (64-bit). 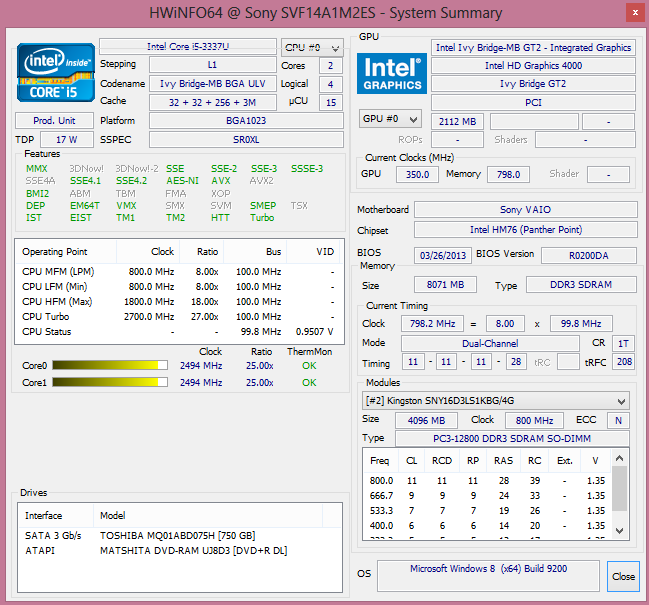 This result is basically identical compared to the lower clocked successor Core i5-4200U, which can be found in the Lenovo IdeaPad U430, for instance. 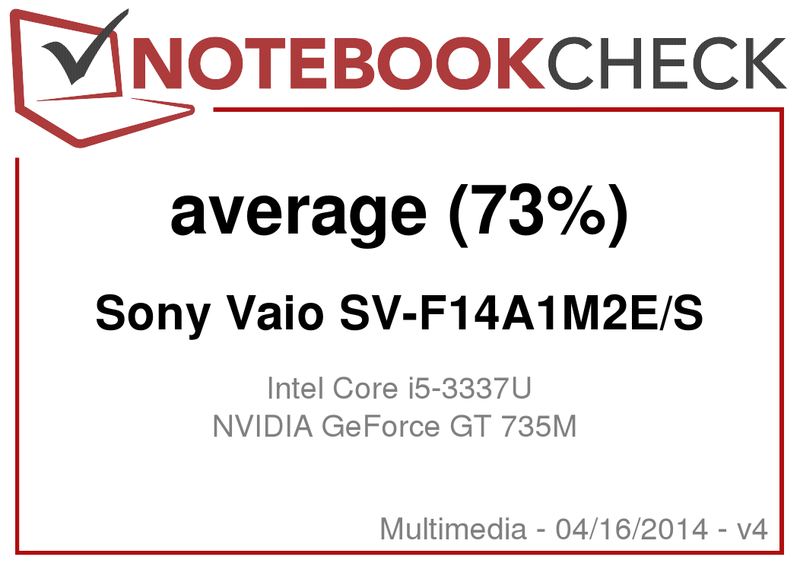 The two high-end processors Core i7-3537U (Vaio SV-F15) and i7-4750HQ (Schenker S413) have a performance advantage of 15 and 28 percent, respectively. While the differences do not really change between the dual-core CPUs in the multithread test, the Core i7-4750HQ can use its full potential. 6.55 points compared to 2.5 points are an advantage of 160 percent; however, this comparison is not completely fair since the quad-core has a much higher TDP (47 instead of 17 Watts). You usually have to decide between capacity and performance when you are looking for a storage solution – at least when you are deciding between an HDD and an SSD. 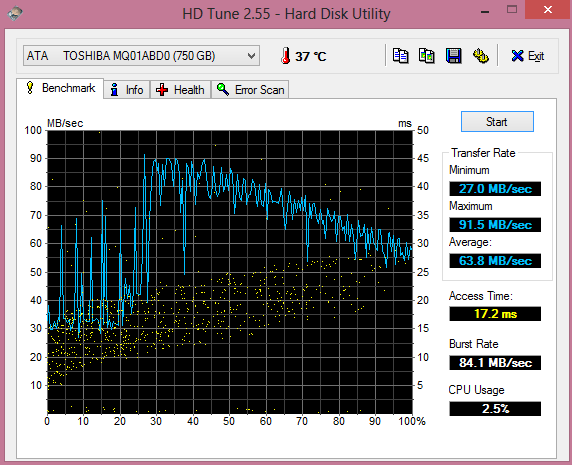 One solution for this problem is the caching technology that combines a large HDD with a small but fast flash storage. Manufacturers had to use two drives for this solution in the past, which required more space and increased the price. Nowadays there are more and more drives that combine both storage solutions in one 2.5-inch drive. That is exactly what Toshiba did with the MQ01ABD075H. The hybrid drive combines a 750 GB hard drive (5,400 rpm) and 8 GB SLC flash memory with an intelligent cache system. However, the effects are hard to see in our standard benchmarks; the average transfer rate in HD Tune is only 64 MB/s – comparable standard hard drives easily manage 85 MB/s and more. The high access time of 17.2 milliseconds does not show any advantages either. What about scenarios that are more realistic? Smaller and frequently used blocks are more important than sequential transfer rates in this case. The drive has to learn this at first – the more you use certain applications the faster it gets. However, the resources of the Toshiba hard drive are very limited with only 8 GB flash memory: We believe there is a certain performance boost during startup but it cannot be compared with a real SSD. 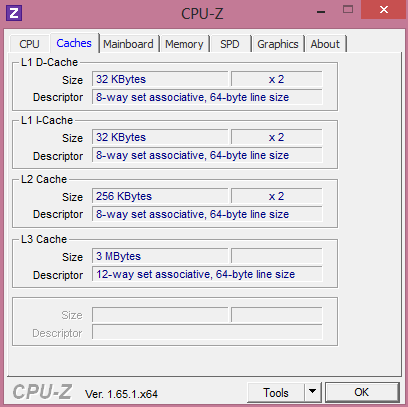 PCMark 7 confirms that the application performance is limited by the small size of the cache. The competition from Lenovo (16 GB cache) and Samsung (24 GB cache) have an advantage of around 30 percent, despite the similar CPU performance. 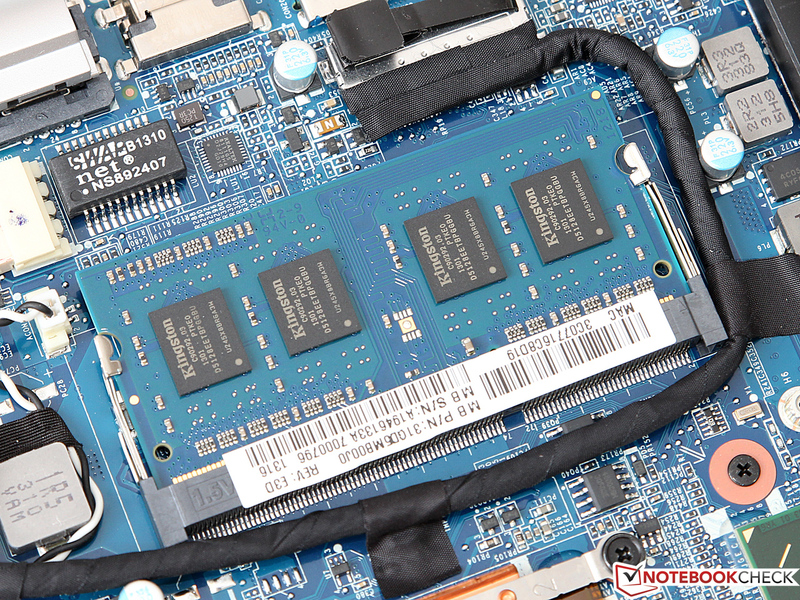 Once again, the Schenker S413 is far ahead with an SSD and quad-core processor. 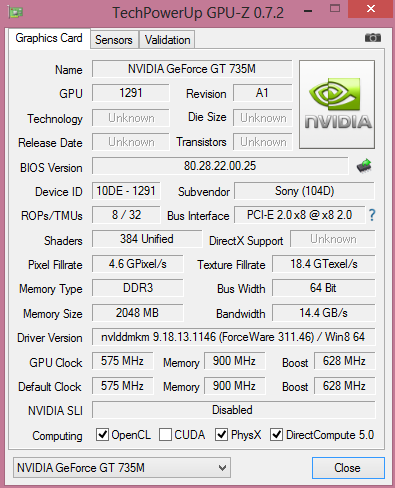 Nvidia’s GeForce GT 735M is based on the latest Kepler architecture, more precisely the relatively new GK208 chip. It is a stripped down version of the familiar GK107, which is used for the GT 640M, GT 650M or GT 750M. 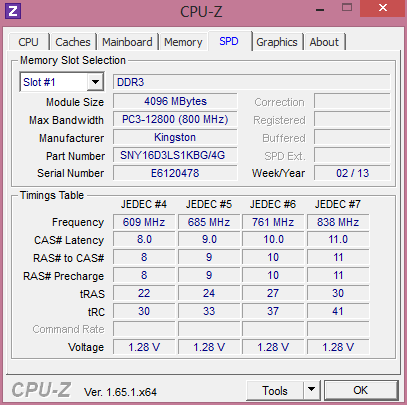 The big difference is that the GK208 can only use a 64-bit memory interface instead of 128-bit. 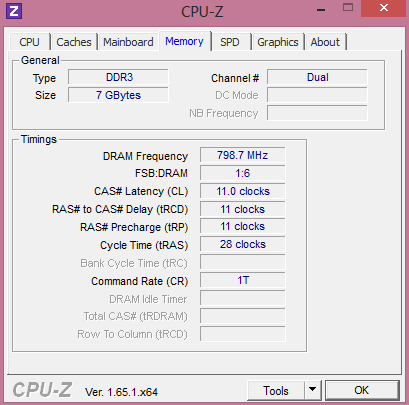 In combination with the 2 GB DDR3 memory clocked at 900 MHz, we can see noticeable performance deficits that cannot be compensated by the high core clock of 575 up to 940 MHz. As a result, the GT 735M is hardly faster than the 64-bit version of the GT 730M while the GeForce GT 640M and the Radeon HD 8750M can take a clear lead thanks to the 128-bit interface. Yet, the real surprise is the Iris Pro Graphics 5200 – who would have thought a couple of years ago that an integrated Intel GPU can disgrace the mainstream competition from Nvidia and AMD? We already checked the gaming performance of the GeForce GT 735M in the review of the Vaio SV-F15, so we just want to test a small selection of popular titles. The GPU is usually too slow for the native resolution of 1,600x900 pixels and you have to reduce the resolution to 1,366x768 pixels and medium details. Most games are running very smoothly with these settings but there are some exceptions like Crysis 3 and Metro: Last Light. We noticed that the difference to the Iris Pro is pretty much identical to the 3DMark results but that the HD 8750M cannot maintain its advantage. Except for a quiet humming of the hard drive, the notebook is almost silent during idle with a maximum system noise of 29.9 dB(A). This is only possible because the fan is completely deactivated under light workloads thanks to the frugal ULV processor and Optimus. The situation changes in 3D applications like 3DMark 06. The noise is increased to an audible but still bearable 44.0 dB(A) within a very short period. 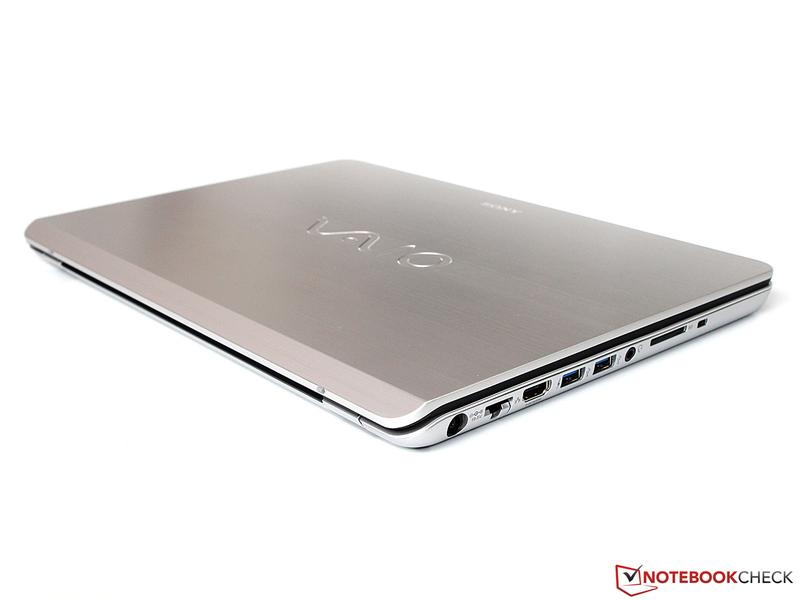 The Vaio is significantly louder than similarly equipped competitors from Lenovo (IdeaPad U430) and Samsung (530U4E). The fast-spinning fan does increase the noise level but also keeps the device cool in return. We can only determine surface temperatures above 40 °C (104 °F) at some spots under high load and many parts at the top and bottom are only lukewarm. Using the notebook on your lap is therefore no problem. 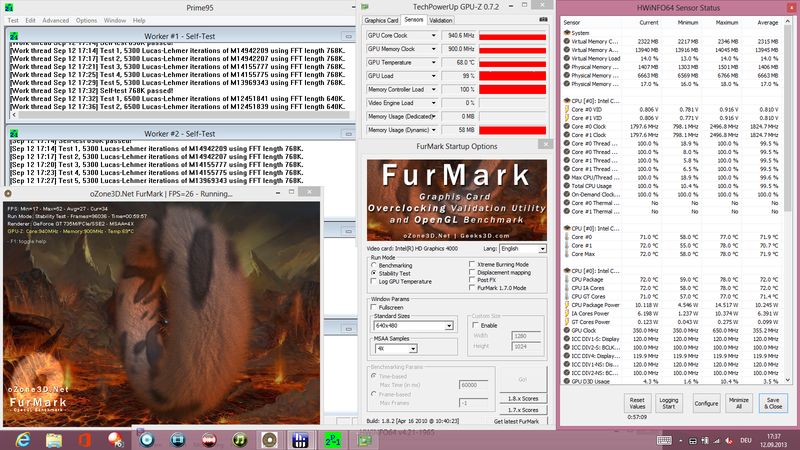 Even our stress test with Prime95 and FurMark is no problem for the device and the temperatures of the components are never in the critical area. We can only measure a comparatively cool maximum temperature of 68 °C (154.4 °F) for the GeForce GPU, despite the high clock of 940 MHz. 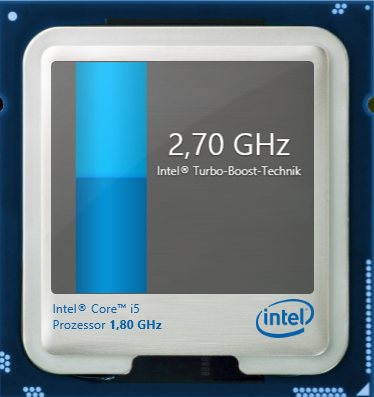 The Core i5 is not much warmer with 72 °C (161.6 °F) but has to waive its Turbo Boost completely. This restriction is not necessary in our opinion – the CPU should not exceed 90 °C (194 °F) even with the maximum clock of 2.5 GHz for both cores. (±) In idle usage, the average temperature for the upper side is 32 °C / 90 F, compared to the device average of 30.9 °C / 88 F.
(-) The average temperature of the palmrest area of similar devices was 29.1 °C / 84.4 F (-6.1 °C / -11 F). Despite the sufficient maximum volume, we cannot really praise the integrated stereo speakers. The flat and tinny sound lacks bass and precision – other manufacturers integrate better solutions. We recommend external speakers or headphones, which can be attached via HDMI or 3.5 mm stereo jack. 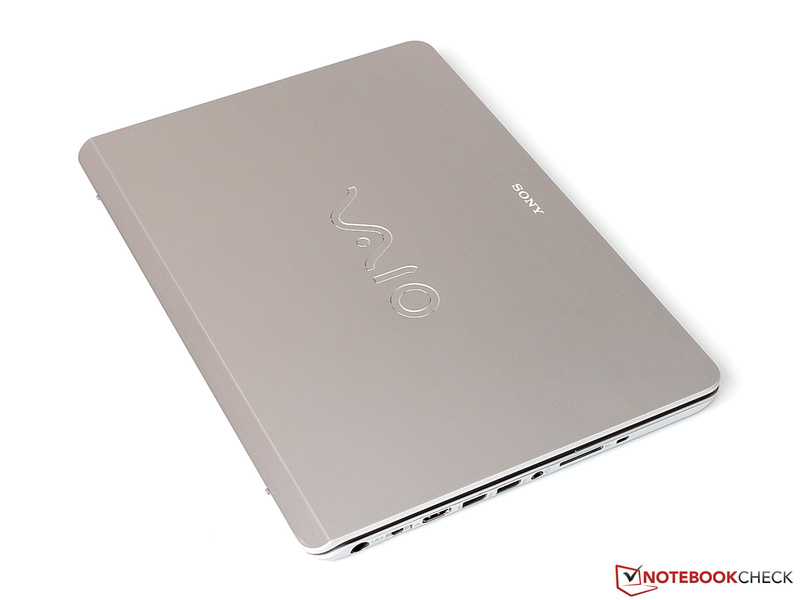 The Vaio does not surprise us in regard to the energy consumption and is in the expected range for this hardware equipment. That means between 7.4 and 12.5 Watts during idle and between 42.4 up to 45.7 Watts under maximum load. The provided 65-Watt power supply unit should have no problems with the consumption. 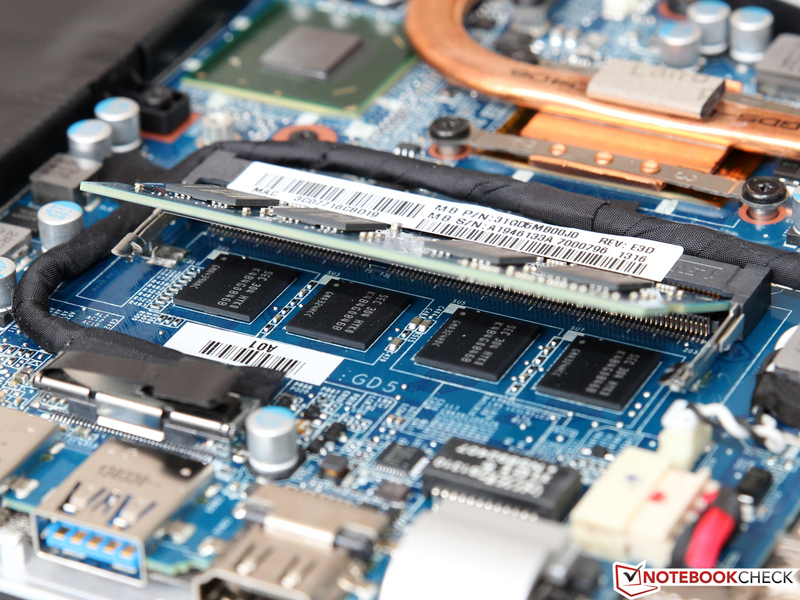 Compared to the rivals we can see that the consumption is pretty much identical to the Lenovo IdeaPad U430 but slightly above the Samsung 530U4E with AMD graphics – it seems that the Radeon HD 8750M is more efficient than Nvidia’s GeForce GT 735M. Considering the meager capacity of the integrated battery (only 41 Wh), we do not expect very long battery runtimes. Our suspicion is confirmed by the Battery Eater Reader’s Test (energy-saving mode, minimum display brightness and deactivated wireless connections), where the notebook cannot surpass the mediocre runtime of 5 hours and 34 minutes. Our WLAN test simulates a more realistic scenario (energy-saving mode, display brightness at around 150 cd/m²). The battery is empty after almost 4 hours; the competitors from Lenovo and Samsung last considerably longer once again with five and a half hours. We determine the minimum runtime with the Battery Eater Classic Test (high-performance profile, maximum display brightness, WLAN activated) that stresses both the CPU and the GPU. 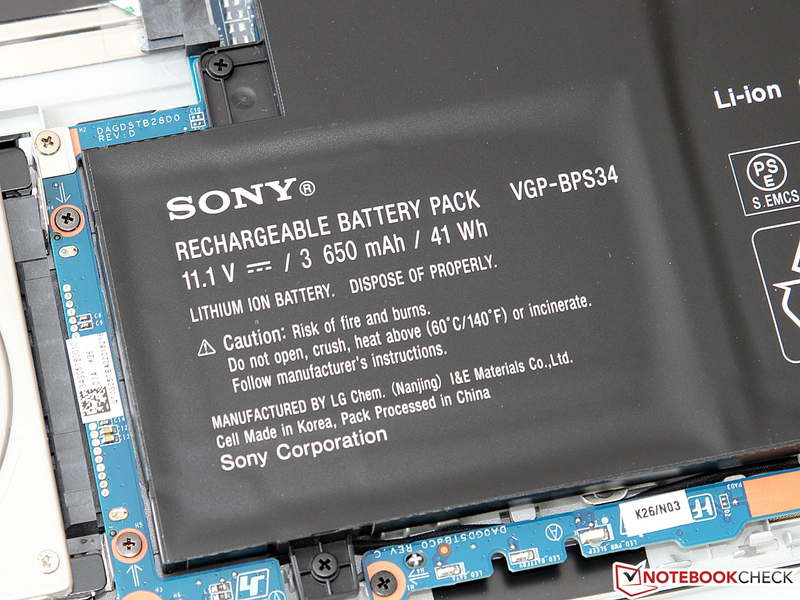 Fortunately, Sony does not limit the performance of the notebook on battery power but you will have to recharge the Vaio Fit after 1 hour and 33 minutes in return. 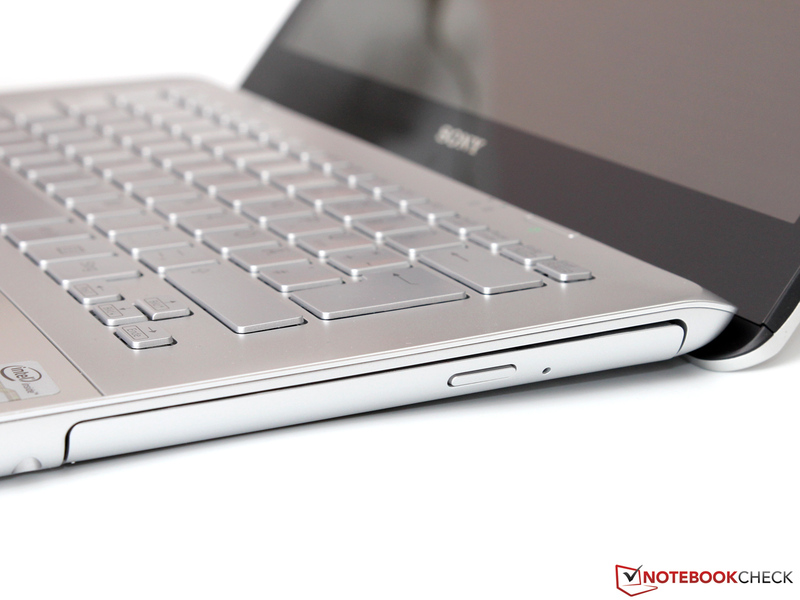 Sony offers a good multimedia notebook with the Vaio Fit SV-F14A1M2E/S, which has some interesting features. There are not many manufacturers that offer similarly inexpensive devices with NFC support and a hybrid hard drive, even though the latter cannot replace a real SSD. 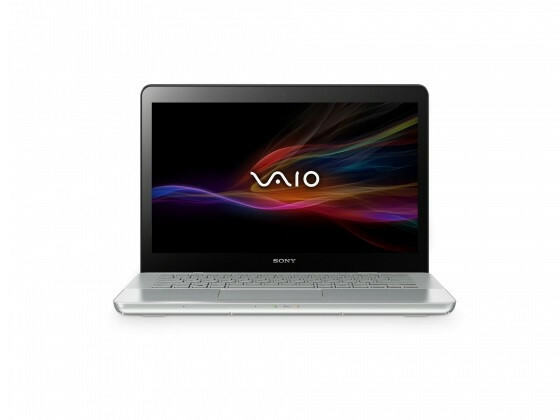 However, the Vaio offers sufficient performance for most applications and games. You can even play the latest titles with smooth frame rates if you are satisfied with reduced details. On the other hand, there are also some aspects that we did not like. 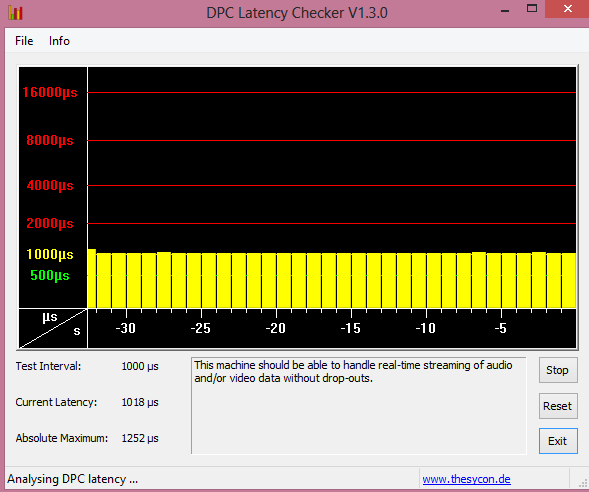 The biggest problem is certainly the weak WLAN performance. We could only maintain a stable connection and acceptable transfer rates with a very short distance to the router. There are also smaller drawbacks like the comparatively short battery runtimes, the lack of feedback from the keyboard or the meager port variety. You can definitely live with these inadequacies – or just have a look at the numerous alternatives. Besides the already mentioned devices from Lenovo and Samsung there is also the rather unique Schenker S413. If you can afford the considerably higher retail price, you get more performance and a better display. 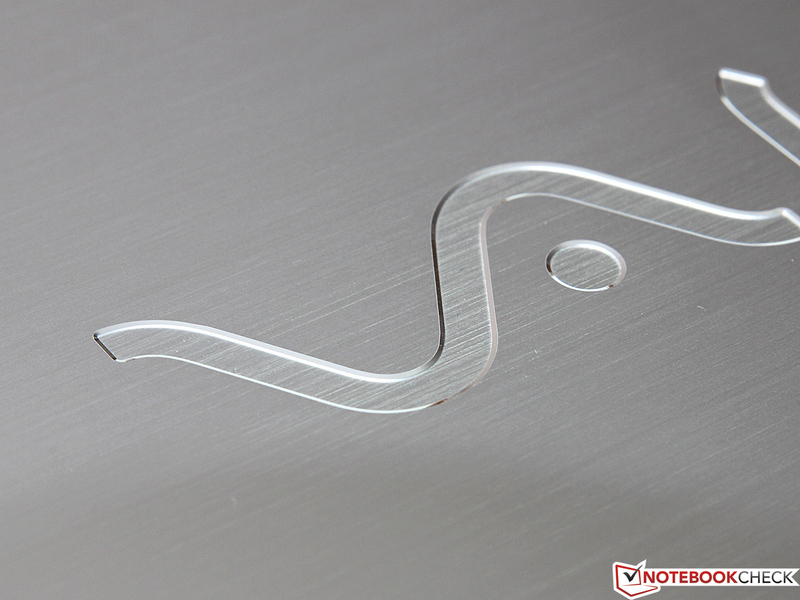 ...and is a characteristic feature of the Vaio SV-F14. ...apart from some small gaps. This especially applies to the aluminum parts. ...can be operated with the fingers. It executes inputs very precisely and without delays. However, the blurry 0.9 MP webcam disappoints. ...but also 2x USB 3.0 and HDMI. ... by white LEDs in dark environments. 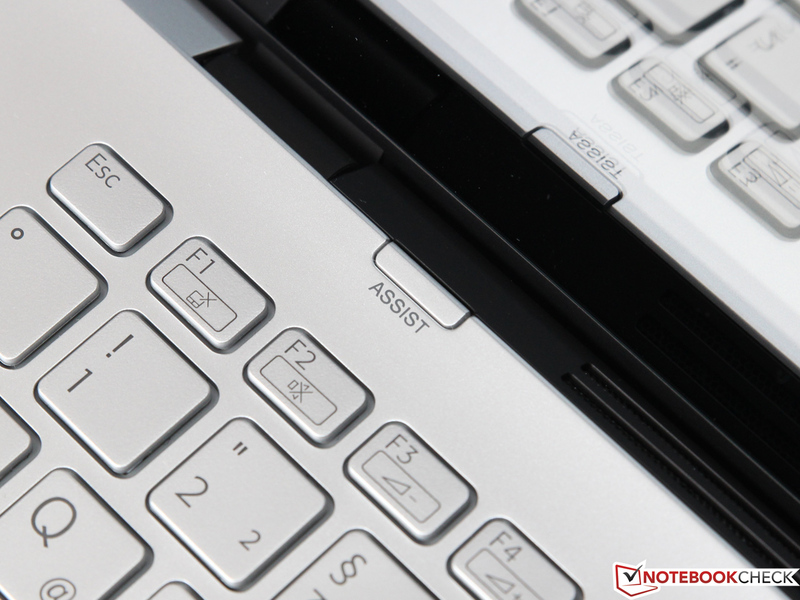 We already know the Assist button from other Sony notebooks. Inside is a Core i5-3337U. The fan exhaust is between the keyboard and the display. ...you can remove the whole bottom cover. ...is another 4 GB RAM soldered onto the mainboard. 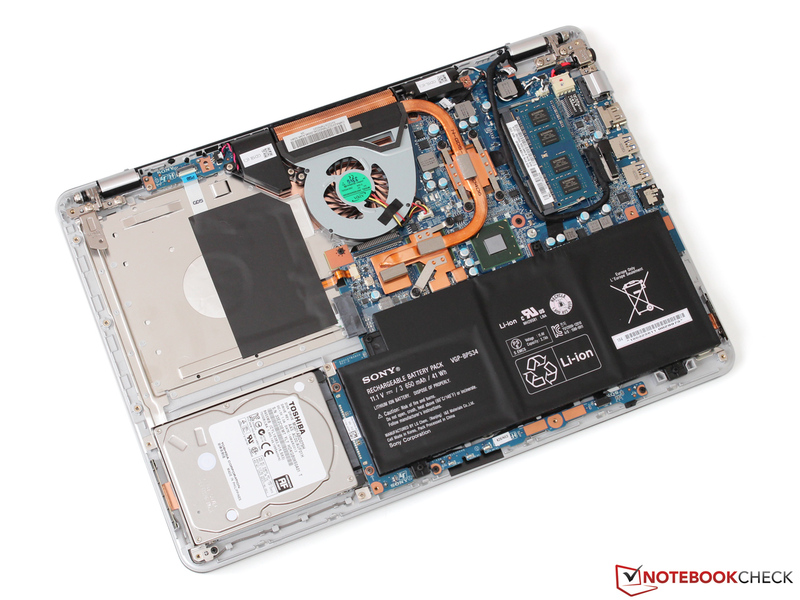 The 2.5-inch bay is equipped with a Toshiba hybrid hard drive with SSD cache. the provided 65-Watt PSU quite often. 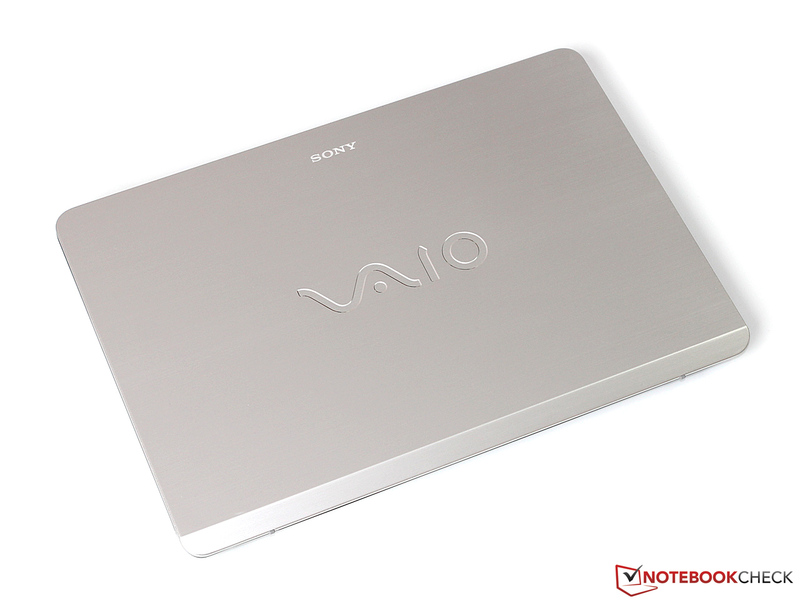 If a nice design is important for you, then you will like the aluminum chassis of the Vaio. 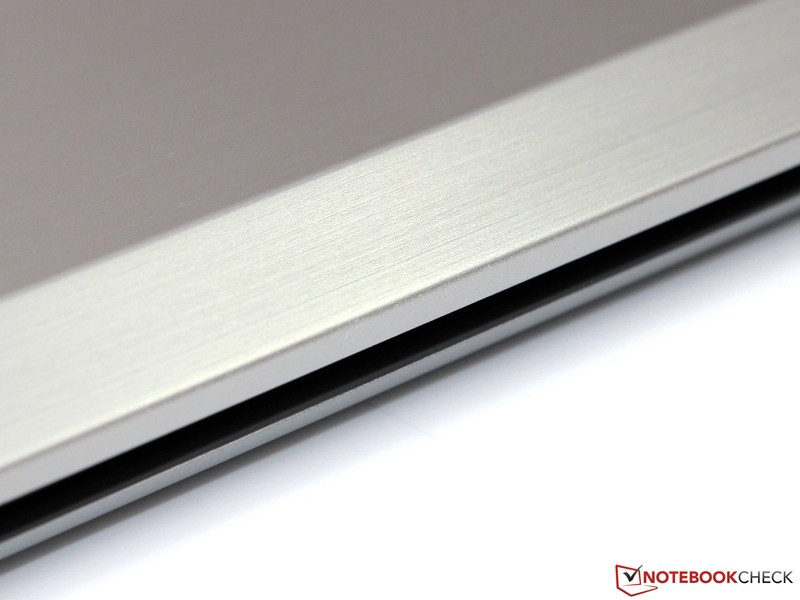 The good build quality, NFC support and the convenient keyboard illumination are other positive aspects of the notebook. 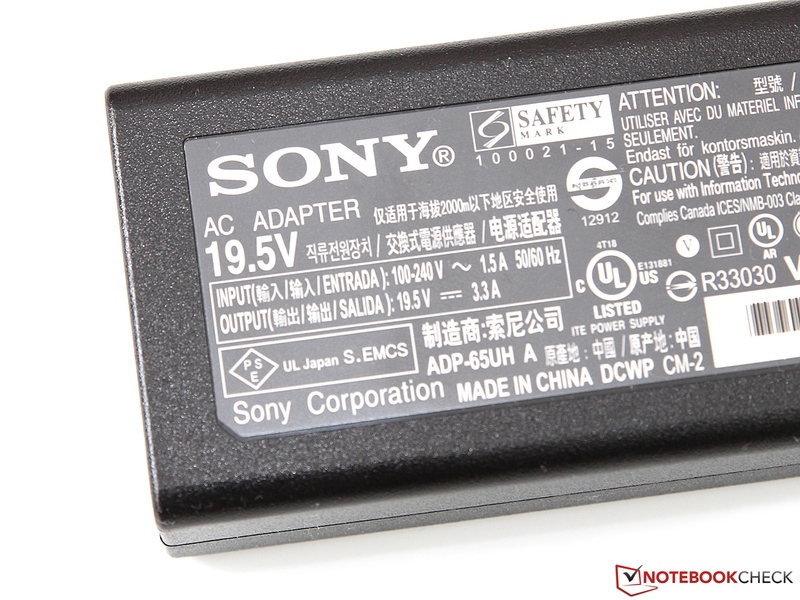 It is unfortunate that Sony only integrated a small 41 Wh battery. This does not support the orientation of the device to offer a mobile alternative to larger and bulkier multimedia notebooks. 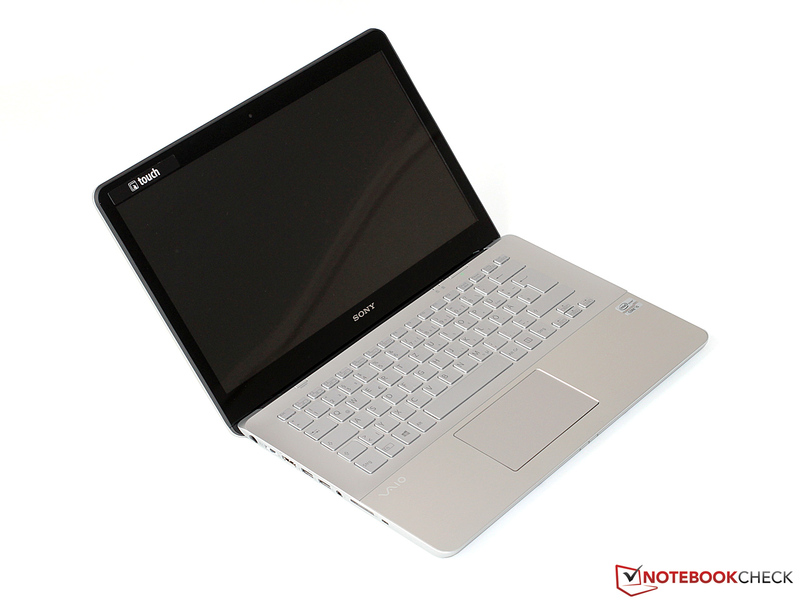 WLAN problems that we determined in our review should be determined by the quality assurance of the manufacturer - especially if it is obviously a fundamental problem that also affected the larger sibling, the Vaio SV-F15. In the 14-inch class: Samsung 530U4E, Lenovo U430 and Schenker S413. 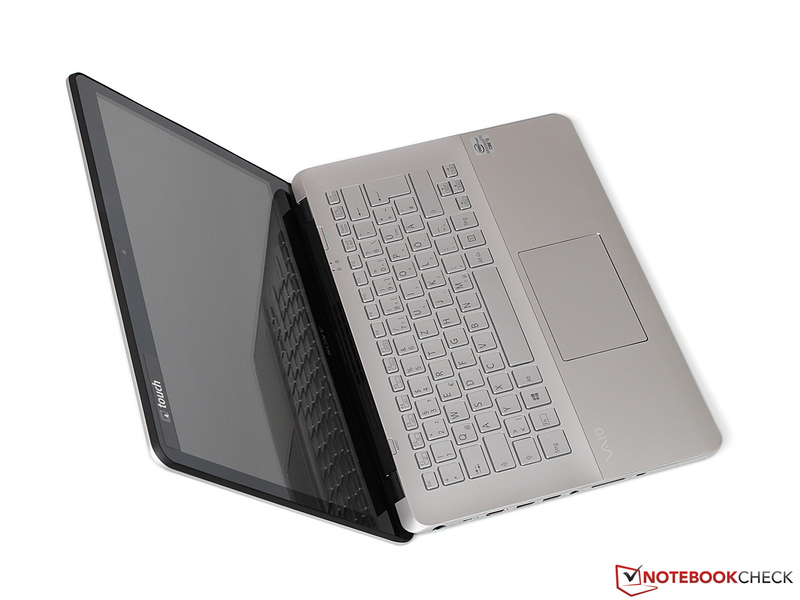 Larger alternatives would be the Acer Aspire E1-572G or the Asus VivoBook S551LB.